Final Fantasy XIV added Blue Mages to the game this week, allowing players to dress in their finest costumes and learn magical attacks from monsters. The “limited” job can’t do as many activities as others, but their addition creates fun opportunities for groups and solo players alike. Blue Mages were announced during the Final Fantasy XIV Fan Festival in November to a mixture of excitement and confusion. Fans were excited about the unique class but unsure what FFXIV’s first “limited” job would mean. The answer is a bit disappointing: Blue Mages can only level up to level 50 and can’t queue up for events like dungeon roulettes, raids, or PvP activities. But the core experience of leveling up your character and finding new skills is fun if brief and brings a lot of color to the game world. I was excited as I waited for the Blue Mage class quest to arrive in-game late Monday night. The city plaza was full of so many players that moving a few step meant waiting some seconds before data loaded and you could see more people. The crowd was dressed in blue, bards played the song “Blue (Da Ba Dee)” by Eiffel 65, and folks tried to summon the NPCs by waving blue glo-sticks. To pass time, I helped judge a costume contest for a group of players excited for a change of pace and new magical skills to try. Unfortunately, the quest giver didn’t spawn until much later Tuesday morning. When I woke up, I started the quest, wherein a supposed swindler is selling access to blue magic. Turns out he’s legit, even if his presentation method is a bit questionable. I was quickly able to access the class, donned a dashing outfit, and began to explore the game world for monsters. Blue Mages learn skills by seeing monsters perform them. To get a new skill, you need to fight a monster, see them use a skill, and then defeat them, which opens up a small chance that you’ll learn the ability. Combine this with the fact that Blue Mages earn a lot more experience off monsters than other classes—presumably because they can’t queue for random dungeons—and my server was full to the brim with Blue Mages. It was fun, encouraging people to get out of cities and private instances. Players in high level zones would call out the coordinates of rare monsters, while other areas were nearly overflowing with Blue Mages trying to get skills. It didn’t always work out—trolls started to head to these areas and kill the monsters before Blue Mages could learn their abilities—but if the goal of Blue Mages was to get people out and about, it definitely succeeded. Part of the fun of Blue Mages comes from trying to know where to find an ability. I’m newer to the game than most of the people I know, so I teamed up with them to speed up the process. Playing in a group of only Blue Mages is a strange thing, but I had a lot of fun. It’s a mix between a normal experience-grinding party and something more deliberate. You run around and beat up monsters, but you ping-pong from area to area, stopping to let Bombs self-destruct in your face or watch a Cactuar fire 1,000 needles. In some cases, we entered dungeons together. Some Blue Mage abilities can only be obtain in dungeons, which means making a premade group and delving deep into risky instances. Because your repertoire is limited to what you’ve seen (and you’re not barred from going into higher level areas), you might not have traditional tanks and healers. But you can still, as I did, have one Blue Mage casting healing spells while the rest fire off 1,000 Needles spells for huge spikes of damage. It’s a more haphazard experience than normal dungeon crawling, but the silliness is fun. It doesn’t take long to level up a Blue Mage; I power leveled from about level 19 to 50 in a handful of hours. A player who was already level 50 showed me an area where I could pull high level monsters and have my tank friend kill them off to gain tons of experience. As a result I was able to go from level 24 to 50 in about two hours. It helped, too, that I had gear provided by a kind crafting friend of mine. That frees me up to focus on hunting monsters and learning abilities, but some players might be disappointed that they are able to blaze through the leveling process, especially since the max power level is lower than other classes. Blue Mage abilities, while fun, are less powerful than traditional classes. As a result, I expect to see the amount of Blue Mages in the field reduce dramatically in the new few days. To make up for their limited utility, Blue Mages have access to special solo content called the Masked Carnivale. This is a collection of combat challenges that players can tackle for rewards like cash and special currencies for redeeming gear. Blue Mages are able to survey a scenario’s details beforehand—what enemies there are, what their elemental weaknesses are—and then try to defeat the challenge using the spells they know. The idea is to make the perfect spell loadout for each encounter and try to defeat the encounter quickly. The Masked Carnivale has nice brain-teasers, and I even spotted players comparing strategies in chat. However, once you figure out what to do, the encounters could quickly become side-content you farm sometimes for some quick cash and nothing else. If the Carnivale expands and adds encounters at a good pace, or even offers new, special challenges from time to time, I can see players testing their skills and even competing for the best completion times. 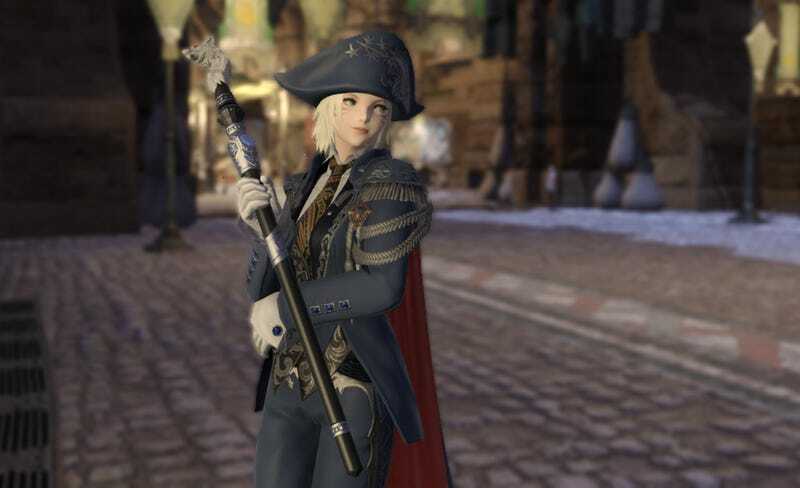 Blue Mage isn’t going to impress players who wanted something more robust, and its limited nature seems destined to produce a fad more than a long-standing class. However, the immediate effect of Blue Mages on Final Fantasy XIV has been pretty magical. Watching my server eagerly await the class and then explode (sometimes literally, thanks to the self-destruct monster ability) into a frenzy of activity has been incredibly exciting. Blue Mages show that limited classed can work in Final Fantasy XIV, offering new kinds of gameplay experiences. Players eager for a change of pace should check it out and embrace the chaos while they can. The process might be fleeting, but it’s tons of fun while it lasts.